Welcome to round three of this 5200 HSC season! 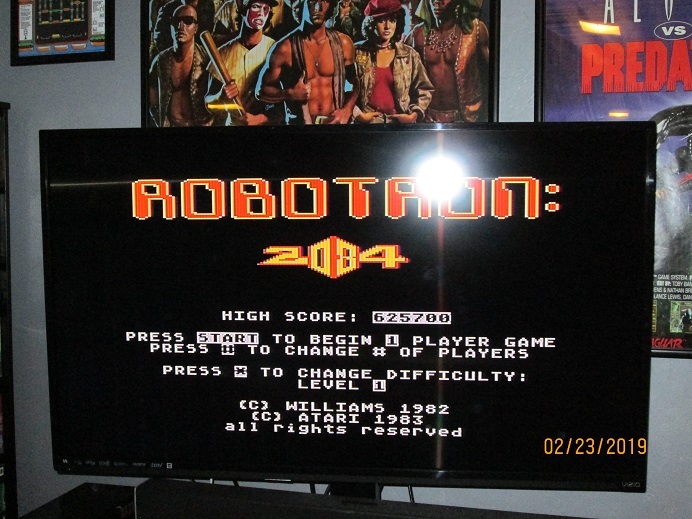 Robotron: 2084 won the poll with 3 votes. Play with default difficult setting. 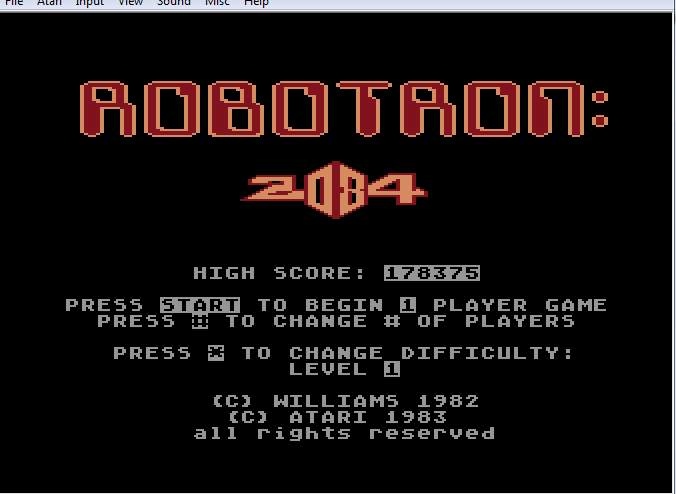 Emulation is fine, as are custom controls. Pics preferred, but not required except for HSC wins and records. 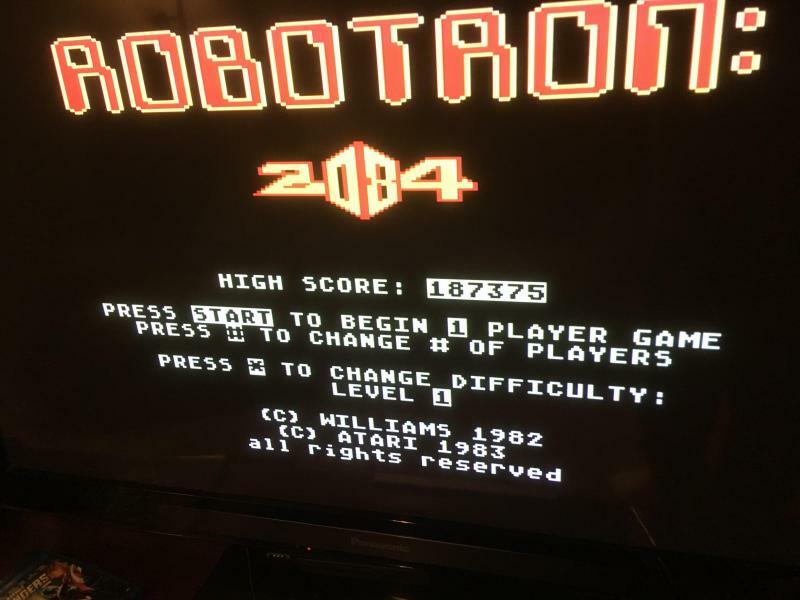 The current HSC record for Robotron was set by darthkur - 558,350 points. Bust it if you can for a bonus point! Edited by atari-dna, Tue Feb 19, 2019 6:45 AM. 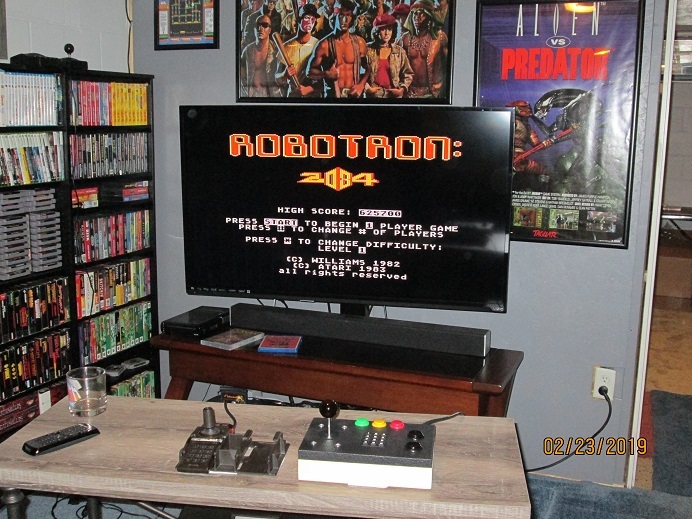 187,375 for my stab at 5200 Robotron emulated on a Dreamcast, holding the standard controller in left hand, and using the fishing controller in my right for shooting. Not ideal but it works. No problem, will look out for your new score submission. Honest mistake. I think it's been discussed in the past, on these 5200 menu screens, as far as picture taking is concerned, there's nothing stopping someone from playing on easy mode, and then just changing the difficulty after the fact so it looks like you played the right difficulty in your screenshot. That's why we all just have to trust each other to play it right. The first time that I play this game with two controllers. Difficult adjustment for me, as I use my left hand normally only for pressing buttons. So, I have two digital sticks, and I decided to test out the setup that way. It actually didn't work. 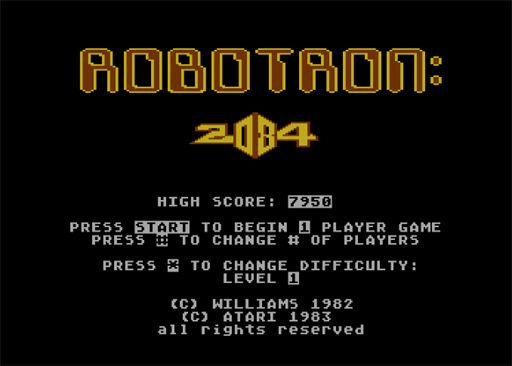 The Competition Pro I plugged in to slot 2, would only fire in diagonals, and the 4 cardinal directions wouldn't fire. That's when I decided to stick with the joystick coupler and two original sticks. That said I have a pretty good starting score. It was playing this game with the coupler that made me realize that the 5200 stock sticks desperately could benefit from an 8-way gate. Obviously, I'm adjusting ok to the controls, but it has to be said, that the lack of a gate is making it difficult to get precision directional shots when you need it. How many times do I want to go straight up or down, and find myself having to keep adjusting from diagonal because the lack of a gate makes it hard to be exact. What's my point? 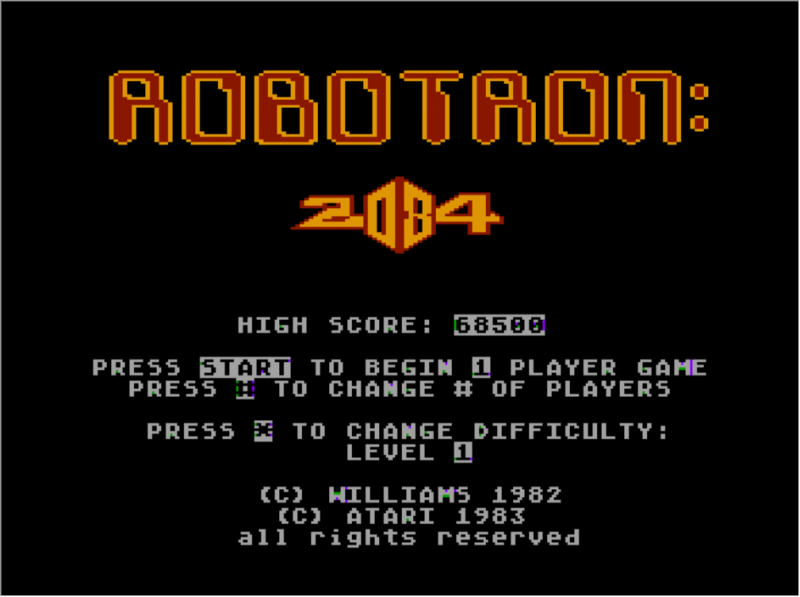 I think once I either master the analog controls with the coupler, or get my digital sticks working right, I'll be crushing that score. 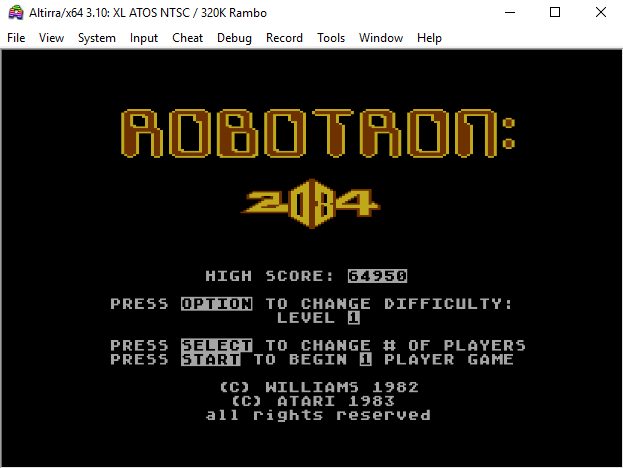 Any hints on playing this under Kat5200? I can never get the controller(s) configured right. I can move around, but can't figure out how to fire. I've tried configuring for both 1 and 2 controllers. I did not even know about the one controller method using the fire button with this game before this HSC, this does not work in kat5200, it is a bug with the emulator. That said I tried it on the real thing and don't think it is a good way to play at all. The two controller method works for me in the emulator. I use the two thumbsticks on my controller, the left one configured for player 1 directions in kat5200, the right one configured for player 2 directions in kat5200 (for firing). I lowered Sensitivity for player 2 to 75 when the left direction did not work consistently. 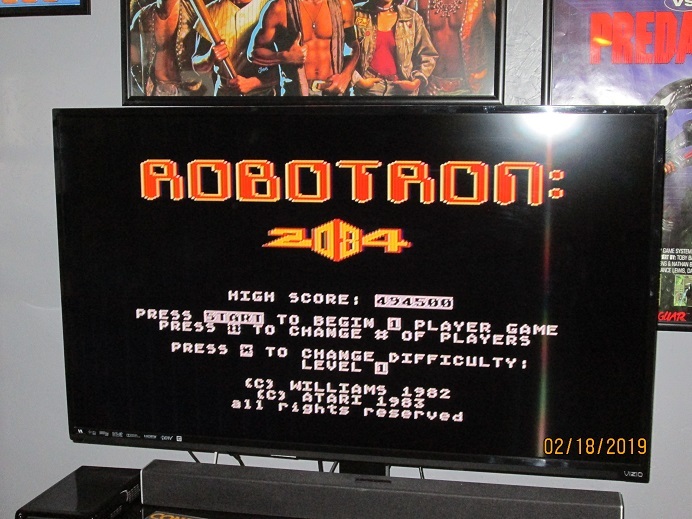 Make sure you have player 2 input enabled and set to Joystick in the kat5200 input screen. Thanks...I will give this a try, but I managed to get it going on Altirra, as well. I keep ending right around 400,000 all week, no improvement. This version is more difficult than the 7800 game. Various factors as to why: fewer colors, clunkier movement, even with the coupler the controls aren't that great. I plan to remedy the controls this weekend. 45325. The colors are off on my system, I simply can't see the circles that turn into enemies until they transform. Need to look at that. Woohoo record breaker! I mounted some joysticks down with 3M command strips. 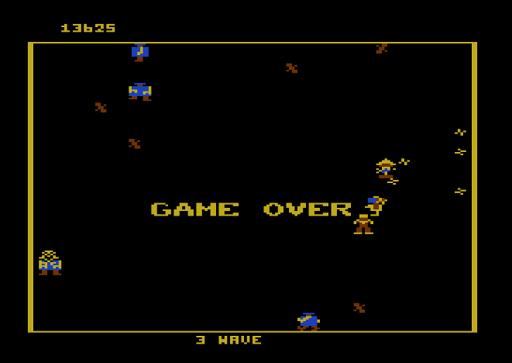 That digital stick made a big difference with 8-way directional firing. I was getting frustrated with the analog fire before. Congratulations! Thats was a tough score to break! That's good stuff man, congorats! Thanks. I'm still trying to extend it, I know I can do a much bigger score than that. Finding time to play is the biggest hurdle.